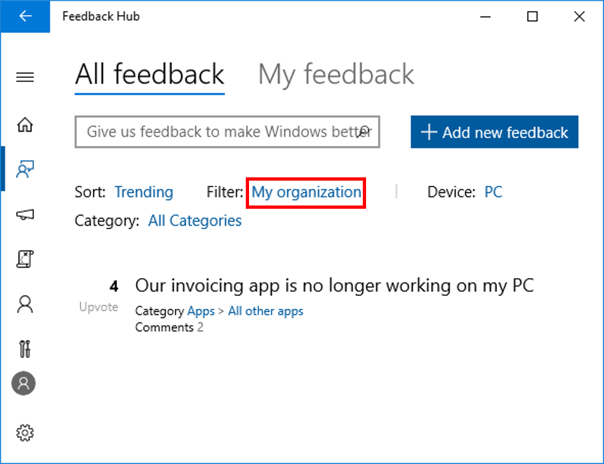 Users can sign into the Feedback Hub using either their personal Microsoft Account (MSA) or Azure Active Directory (AAD) organizational account. Signing in with an AAD account allows users to submit feedback to Microsoft on behalf of their organization. Additionally, this feedback from Azure AD users can be tracked through the Feedback Hub other users in the organization. Register as a Windows Insider with your work account in Azure Active Directory. Sign into the Feedback Hub using this same work account. On the Welcome page of the Feedback Hub, click on the People icon, lower left and select or add your AAD work account. If you're signed in to the Feedback Hub App using your personal MSA, you can switch to your work account by clicking on your account, signing out and signing back in. Note: The Feedback Hub needs a user's consent to access their AAD account profile data (we read name, organizational tenant ID, and user ID). When users sign in for the first time with their AAD account, they will see a pop-up asking for permission. If a user cannot give consent in the pop-up, Feedback Hub may be blocked. Administrators can unblock in the Azure portal. Go to Enterprise applications section and enable Users can allow apps to access their data. To submit feedback, go to the Feedback Hub and click on the Feedback tab in the upper-left corner off the screen. For more information on submitting effective feedback, see: How to provide effective feedback. To track feedback submitted to the Feedback Hub by other users in your organization, go to Feedback>All Feedback. Under the Filter drop-down, select My Organization. NOTE: You must sign in with your registered AAD account to track feedback from users in your organization. Feedback filtered with this view will only show feedback from users in your organization who sign into the Feedback Hub using their registered work account in AAD.